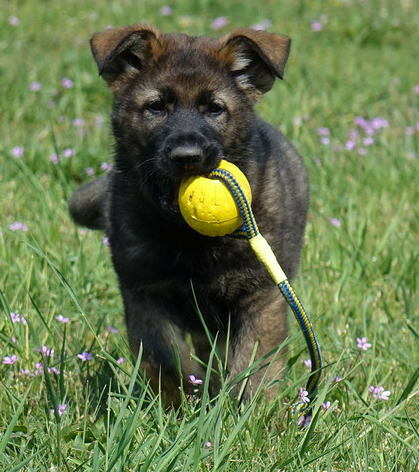 We guarantee strong health, strong bones, solid nerves, gorgeous colors and high trainability of the pups. I want to thank you for the outstanding male puppy that you sent to me. He was everything that you said he would be and more. Only after the second day in his new home, he was barking with a deep and fast bark at people passing by. He is only eight weeks of age and already he is watching over my family and I. I had german shepherd dogs all my life and they did not show this behavior until they were around four or five months of age. I heard from some dog people that working line dogs have too much drive and are hyper. So naturally I was hesitant at first about bringing this type of german shepherd dog into a family atmosphere. I wanted a dog that would be a good family protection dog and at the same time a dog that would settle down and not drive my family and I crazy. Hans, you explained to me that while there are working dogs with a lot of drive, there are also working line dogs that can settle. You are correct, the puppy settles down nicely yet can work. Also the puppy is a beautiful bi-color dog with coloring that is not common any more. Many german shepherd dogs today have faded coloring. The dark color on this puppy is rich and even his paws have the rich coloring. I want to say that you tell it like it is and do not sugar coat anything when it comes to the puppies and dogs that you have. It is nice to talk with someone who will tell you the good and the bad about the puppies and dogs that he has. You will say when you think that a dog or puppy is not suitable for that person. Wow, that is rare to hear a breeder and/or broker say that today. Lastly, Debbie has been a great help with the details about the puppy including all the paper work and the shipping of the puppy. It was a pleasure and easy when I picked up the puppy from the airport. Everything was in order. I want to wish you and Debbie the best! Copyright © 2012 Alpine Safety K9 International. All Rights Reserved. All Dogs and Puppies are Sold on Strictly a First come First Serve Basis. There is no other Preference. The Dog or Pup is For Sale until the Deposit arrives. In cases of multiple deposits, the first one that arrives gets the dog. If your deposit is not the first one then your funds may be credited to a different Dog or Puppy or Returned as you desire. We keep exact records of the dates and times when all deposits are received.